We asked Great Lakes photographers to send us some of their favorite or toughest Great Lakes shots. 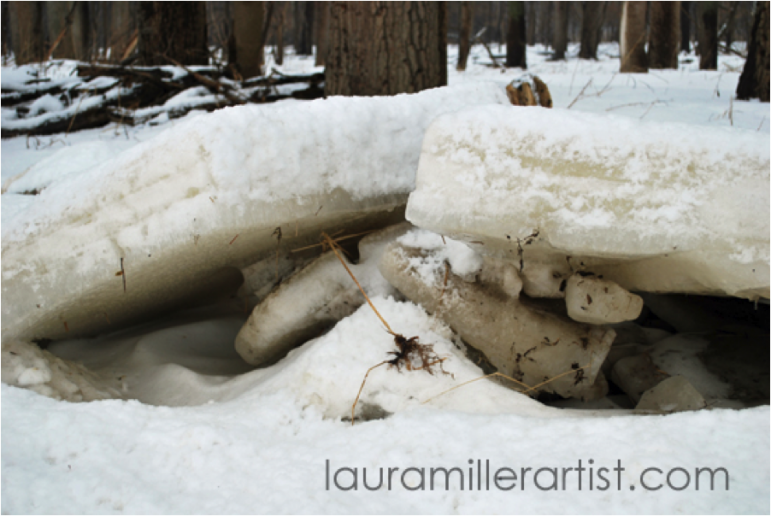 Photographer and artist Laura Miller sent us these photos. Late January 2014 has been particularly difficult along the Maumee River in Ohio because of the amount of snow and rain we received with near-record precipitation. These photos of an ice jam reflect the challenge of the river environment with the next challenge being flooding in the spring. Although this part of the river had an ice jam, farther upstream the water was flowing freely as the ice had been swept away. The Maumee River is the largest Great Lakes watershed and feeds into Lake Erie. There is a wonderful park system that follows the river providing abundant opportunities to enjoy the river. Getting to the river isn’t the easiest during the winter months. The most difficult aspect of this photo adventure was knowing where the river bank ended and the river began. 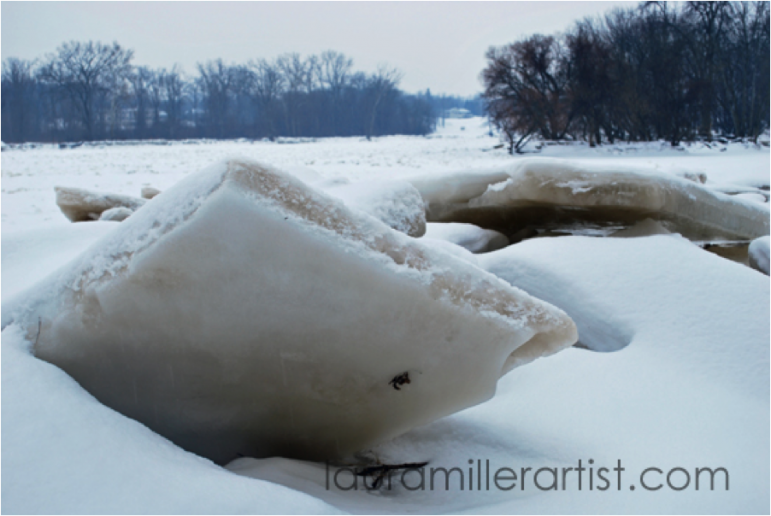 You can’t help but respect the power and beauty of the ice when you’re actually on the banks of the river. 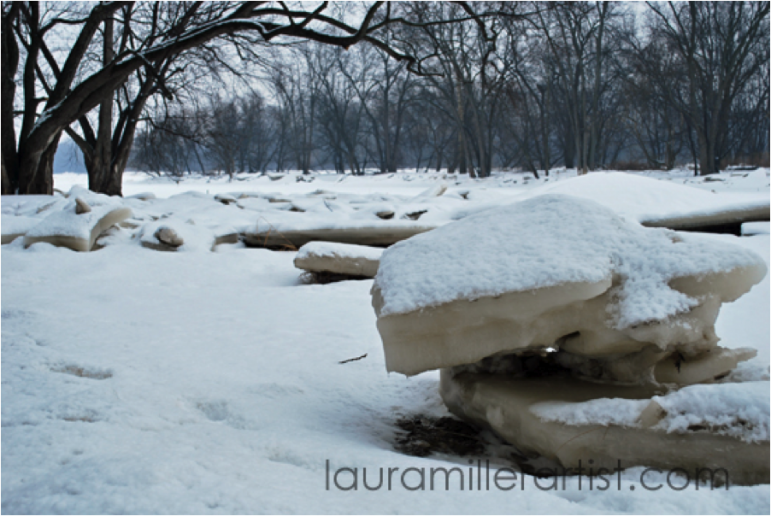 As you get closer to the water’s edge, you can easily go through the ice not knowing there is water flowing underneath. 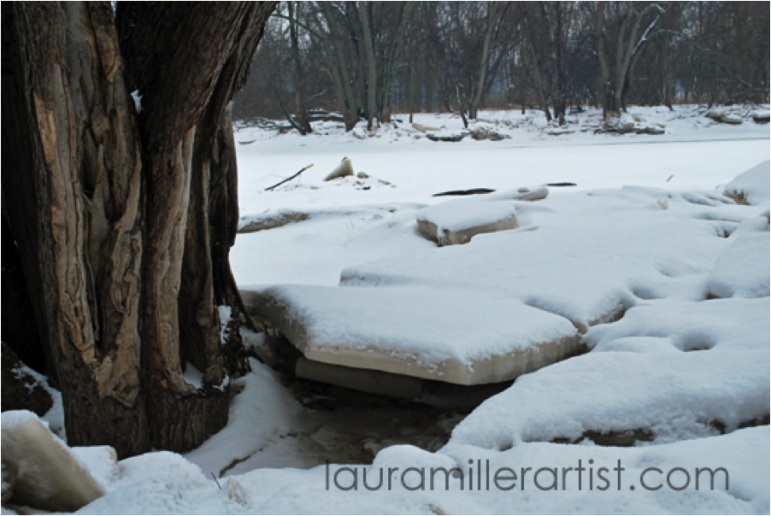 It had snowed overnight, so the river had a quiet solitude that comes with a new blanket of snow. These photos appear to have been taken in sepia or black and white, but they were actually taken in color. Because of the weather conditions, the whole day was like living in a black and white photo… a misty and dreary day. I used a Nikon D60 camera for these photos. 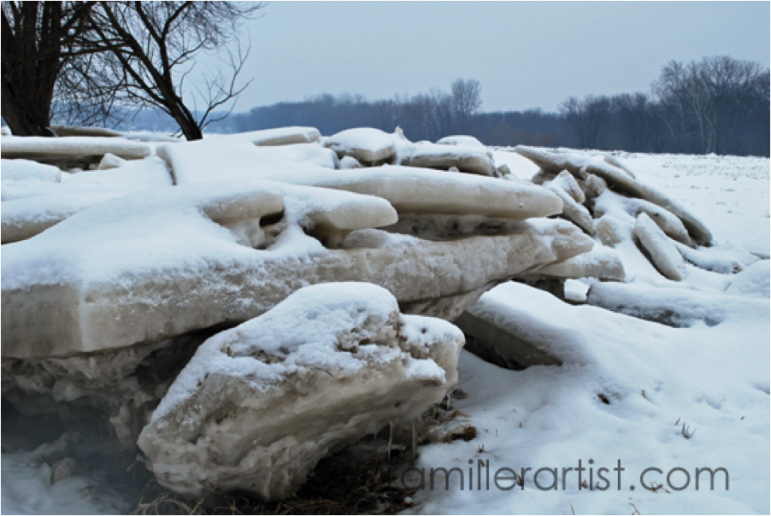 The power of the river and ice is evident by the layers of the ice slabs and uprooted trees. The ice slabs have been pushed up into the forest’s edge, taking grass and soil along with it. 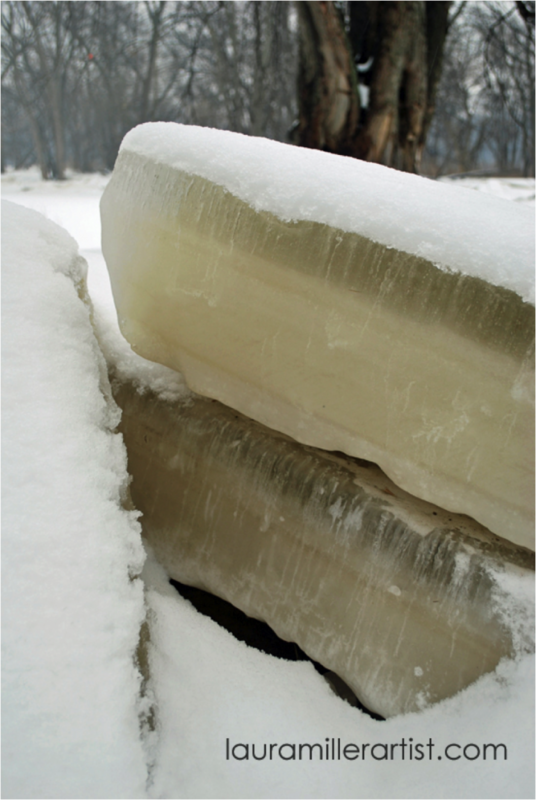 Ice slabs on top of each other in a sculpture-like fashion…art by nature. 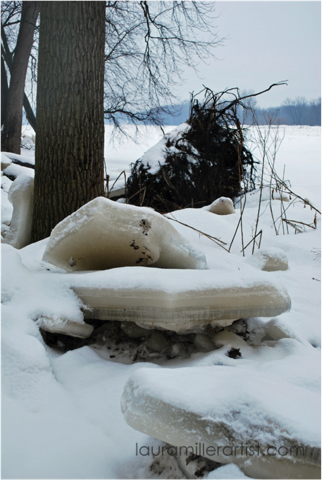 These huge slabs of ice jutting out appear to have been tossed along the shore. Many are three and four times the size of tabletops. There are layers in the ice making it over a foot thick. You can’t be certain where the river starts because of the ice slabs broken into puzzle like pieces. 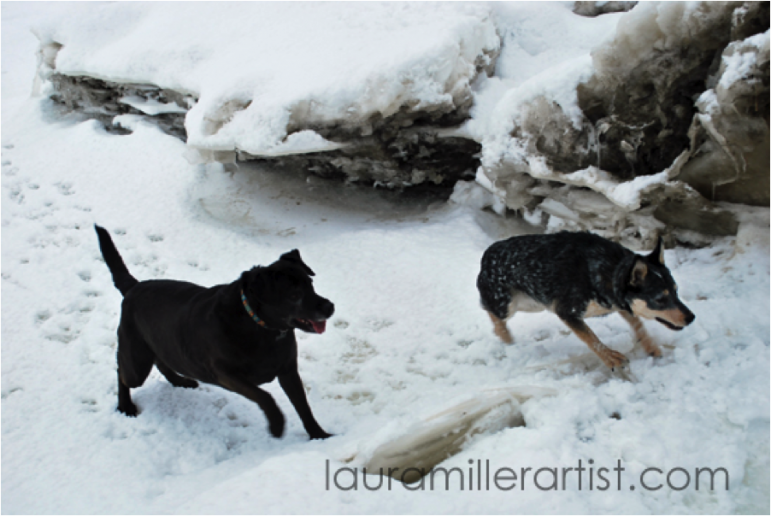 The dogs (Tina & Junebug) love to go on photo adventures. They wanted to go out on the river but I called them back. No dog search and rescue for them.